GOP Rep. Matt Gaetz Regrets Appearing On InfoWars - Joe.My.God. Rep. Matt Gaetz (R-Fla.) on Wednesday said he regrets his appearance on a radio show hosted by Infowars founder Alex Jones. 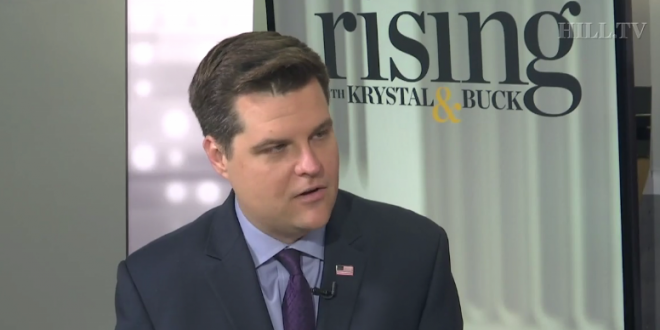 “I would not go back on Alex Jones’ show,” Gaetz told Hill.TV co-hosts Buck Sexton and Krystal Ball on “Rising.” “Upon further reflection, I think the things that Alex Jones has said and done are so hurtful to so many people that a member of Congress should not grace that platform and legitimize it,” Gaetz added. Click to watch the video. He’s not THAT sorry.